The movement to expand and use international law in the Western Hemisphere received a big boost in the fall of 2017 when the General Secretariat of the Organization of American States (OAS) and the American Bar Association (ABA) signed a cooperation agreement on October 26, 1017 in Miami, Florida during the annual fall meeting of the ABA’s Section on International Law. 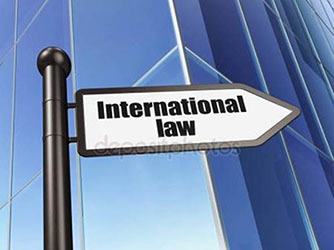 The cooperation agreement obligates each party to work together for the “promotion of the rule of law and the dissemination and development of international law within the inter-American legal system. The announcement of the agreement recognized an ongoing commitment of the OAS member states to further develop international law as a “way to strengthen relations among states and to foster peace and stability” in the hemisphere. The new agreement will allow the OAS to join forces with the ABA to further that mission and also to further the ABA mission of “defending liberty and delivering justice.” The agreement is consistent with the right of OAS member states to request the General Secretariat “to promote agreements with various entities for the teaching and dissemination of inter-American law under the Inter-American Program for the Development of International Law. The Department of International Law within the offices of the General Secretariat of the OAS will be responsible for “coordinating the activities” under the agreement. The parties envision activities that include “legal cooperation projects for the training of other legal professionals; various types of legal and comparative. research; joint organization and participation in conferences, seminars, roundtable discussions and other events to promote dialogue among lawyers, government officials, diplomats and technical experts. The United States Supreme Court is, as of the beginning of the coming year, 229 years old. It took almost two hundred years for the U.S. Government to appoint a female to the Court. Being able to choose from a greater variety of wines from Australia, Chile, and other countries. Any resident of the United States who drinks a lot of wine, or even an occasional glass, to such an extent that a trip to the local wine or grocery store is periodically required could not fail to notice that the number of types of wine, as well as their places of origin has increased rapidly in recent years. On Thursday, December 14, 2017, the ICC’s Assembly of States Parties took the historic and significant decision, by consensus, to activate, effective July 17, 2018, the ICC’s jurisdiction over its 4th crime, the crime of aggression. There is an announcement in another part of this issue of the International Judicial Monitor relating to a recent development of large significance for the future of international law. Under the impetuous and aggressive sway of Benito Mussolini - Il Duce (“the leader”) as he insisted on being called – fascist Italy became involved in a number of foreign military adventures, and mis-adventures. The best known was the conquest of Ethiopia in 1935-36, achieved in the teeth of economic sanctions by the League of Nations, and helped along by doses of poison gas. At the beginning of November 2017, I delivered two addresses in Bogota, the capital of Colombia. Both related to transitional justice. Armed conflicts and mass atrocities are usually preceded by a propaganda campaign in which public figures and opinion shapers foment ethnic, national, racial or religious hatred, and incite their followers to acts of violence. Wetlands are among the most productive environments in the world. Currently the United States is not viewed as a world leader in the promulgation and acceptance of international law. However it has not always been that way. The world shivers at the mention of terrorism. As a matter of fact, modern terrorism has proven to pose the most serious threat to global peace and human rights.